It is the wisdom of the ancestors that “if you know the beginning well, the end will not trouble you”. Therefore, when we receive news that the FBI released a so-called “intelligence assessment” pretending a threat from a group of “Black Identity Extremists” that doesn’t exist, we need not be shocked, shaken or even surprised. For throughout history, it has been the devious way of oppressors to deny and divert attention from their own brutal oppression by constantly indicting and dehumanizing the oppressed. It is also their way to justify practices of repression already in place and to signal and drum up support for policies to be intensified and expanded to deal with Black dissent, defiance and resistance. Thus, as we pass through these trying, troubled and turbulent times, let us reaffirm our continuing commitment to set aside all illusions about race and reality and intensify the struggle and stand steadfast and united in the storm rising on the horizon and sure to hit and make landfall in the days to come. The FBI report, issued August 3rd, is titled “Black Identity Extremists Likely Motivated to Target Police Officers” (BIE). It claims to be a report alerting the country to an emerging threat from “Black Identity Extremists” who are ideologically motivated to retaliate for “perceived police brutality” against Black people. However, Rep. Karen Bass (D-CA) did a masterful job in questioning U.S. Attorney General Jeff Sessions about it at a House Judiciary Committee hearing and read it into the record. She gave him no quarter as he hemmed, hawed and hedged, dissembled, pretended and demonstrated ignorance, and sought sanctuary in feigned confusion and mercy requests to be allowed to review and submit answers in writing later. She forced him to admit there is no evidence of any Black identity extremist group which has targeted police; that there are white groups who do this and that the government has written no similar report on “white identity extremists”; and that “activists around the country are very concerned that we are getting ready to repeat a very sad chapter in our history where people, who are rightfully protesting injustice, are unjustly labeled as extremists and subjected to surveillance and harassment”. And she requested that he “essentially roll back what is listed in this report. Because it’s not accurate”. The “sad chapter of our history” reference is to the history of the Counterintelligence Program (Cointelpro) of the 60’s and 70’s. Initiated in the 50’s, it became especially focused on us as a people in the 1960’s when J. Edgar Hoover, director of the FBI, established it as a program to crush Black resistance. We of the organization Us are both victims and survivors of Cointelpro and have learned, in sacrifice, struggle and reflective study, lessons of defense, development and resistance under heavy suppression. And it is this costly and strength-through-struggle experience that gives us special insight into how this new established order policy will play out and how we should respond. Hoover listed as his essential aims to “expose, disrupt, misdirect, discredit or otherwise neutralize Black nationalist organizations”. And to “neutralize” still carries with it an open-ended range of means to achieve its end. Above all, he wanted to prevent our unity, he said, because “in unity there is strength”. And that unity in struggle was the greatest threat to the established order, not a single group. Black nationalist groups were identified, targeted and subjected to various forms of assault; infiltration and disruption; invasive surveillance; legal and extra-legal harassment and violence; media myth-making, attacks and disinformation; provocation of intragroup and intergroup fighting, etc. Among the major groups targeted were the Nation of Islam, Us, BPP, RAM, RNA, SNCC and CORE. Civil rights organizations were also targeted, but special attention and attacks were directed toward Black nationalist groups. Us was early defined as a radical and revolutionary organization by itself and by the U.S. Government and its intelligence agencies and police departments. And it was placed on every surveillance and suppression list that any other group so considered was placed. Indeed, the FBI stated in its files on Maulana Karenga its concerns about Us’ commitment to revolutionary struggle; that its leader, Maulana Karenga, “is a key figure on both the SI (Security Index) and AI (Agitators Index), and that Us “plans for revolution (and) is currently training its members in revolutionary tactics” and it is classified as an “organization whose aims include the overthrow or destruction of the U.S. by unlawful means”. Therefore, it concluded the bureau should take counterintelligence measures against Karenga and the organization Us, including working to discredit Karenga within the community, the movement and his own organization; provoke conflict and fighting between Us and the BPP and alienate them from the community, and divide the movement through disinformation and staged incidents to sow fear and dissension. When the SI and AI programs were reorganized, Karenga and Us were moved to KBE (Key Black Extremists) and ADEX (Administrative Index) Priority 1 lists. And as late as 1975, an FBI memo claims Us is engaged in activities which could violate a series of U.S. codes dealing with “rebellion, sedition and advocating overthrow of the government”. As a result of this classification, targeting and attacks, we suffered police suppression, political imprisonment on trumped-up charges and were forced underground and in exile in other countries as other groups. Surely, the BIE report is a beginning variation on the Cointelpro, revived with greater technological capacity for disruption and disinformation, and in a climate of seeded and cultivated racialized fear and hatred conducted by a man at the top of the heap addicted to name-calling, dog whistles to racists and early-morning twiddling and tweeting “while Rome burns” and he threatens to burn the world. It might seem to be about one group, but it is actually about the Black community. It is a continuation of racializing crime and criminalizing the race, and thus an attack on Black identity and Black people, making us all suspects and offenders and subject to the harshest measures, especially activists. It is also, then, to criminalize and discourage Black resistance, an attempt to intimidate and terrorize activists and potential activists, sowing fear, doubt and heightening concern for safety, security and stigmatization for work, career and life. It is also an attempt to redefine the emerging, overarching Black movements for racial and social justice as extremist rather than righteous struggle against injustice and oppression. And finally, it is an attempt to shift attention from state-sanctioned white supremacist and police violence against Black people and to justify increased police presence and repression in the Black community. Now some and maybe many will come and counsel caution, cooling off, reconsideration and reconciliation, and others will shamelessly advise silence and surrender; introduce those willing to funders and granters of favors, suggesting that you think of a narrower and self-focused future with diminished integrity and whatever comfort, safety and security you can beg and bargain for yourself and those close. But again, history and hard lessons of life and struggle have taught us: there is no substitute for freedom and justice with dignity; that these and safety and security come not from resignation but resistance; not from conceding in silence but confronting in audacious and effective ways; and not from surrender to evil, injustice and oppression but from united, righteous and relentless struggle on every level and every battlefield and battle line. 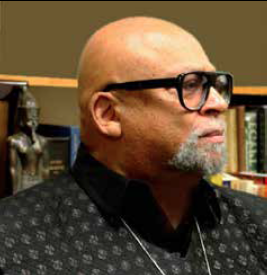 Dr. Maulana Karenga, Professor and Chair of Africana Studies, California State University-Long Beach; Executive Director, African-American Cultural Center (Us); Creator of Kwanzaa and author of “Kwanzaa: A Celebration of Family, Community and Culture and Essays on Struggle, Position and Analysis”; www.AfricanAmericanCulturalCenter-LA.org; www.OfficialKwanzaaWebsite.org; www.MaulanaKarenga.org.